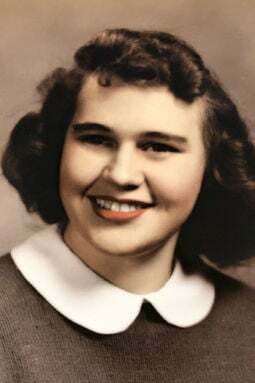 Dorothy J. Ussery, 87 years, of Fremont died Monday, Feb. 4, 2019, at Dunklau Gardens in Fremont. Dorothy was born July 5, 1931, in Fremont to Herman and Alma (Anderson) Kallstrom. She graduated from Abraham Lincoln High School in Council Bluffs, Iowa, and resided in Fremont the majority of her life. She was employed as a bookkeeper at Alco in Fremont until the store closed. She worked at Gerhold Concrete for several years, Jupiter Store and Ussery Sand & Gravel in Fremont. She also sold Avon products. She was a member of First Christian Church in Fremont, Parents without Partners, TOPS, SMILES and Eagles Auxiliary. She also volunteered at the Blood Mobile and Fremont Area Medical Center. She enjoyed dancing, bowling, card clubs and was an AVID HUSKER FAN. Survivors include son, Tom (Denise) Ussery of Roseville, California; daughters, Sandy (Brad) Osborn of Fremont and Susie (Hal) Matyas of Gilbert, Arizona; seven grandchildren, Matt Osborn, Amanda Barron, Jon and Josh Ussery, Katrina Ondracek-Wilson, Kari Ramirez and Jessica Bredvik; and 10 great-grandchildren. Preceded in death by her parents; daughter, Barbara Ondracek; sisters, Irene Langston and Alta Philips; and brother, Robert Kallstrom. The funeral service will be 1:30 p.m. Friday, Feb. 8, at Moser Memorial Chapel in Fremont. The Rev. Scott Jensen will officiate. Visitation will be Wednesday, Feb. 6, from 5 p.m. to 7 p.m. and Friday one hour prior to the service, all at the funeral home. Burial will be at Ridge Cemetery in Fremont. Memorials may be directed to the Eagles Auxiliary in Fremont.